It has taken Zoe Hart two full seasons to win over the citizens of Bluebell and that was with a lot of effort on her part. Well, once she stopped making fun of their small-town ways, that is. 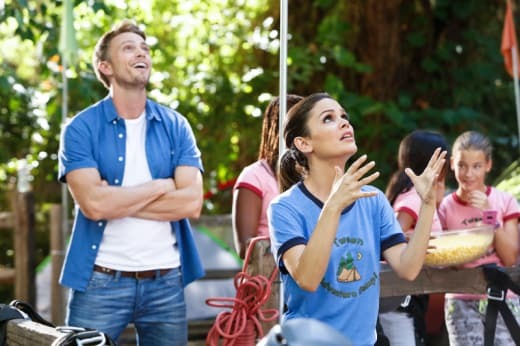 On Hart of Dixie Season 3 Episode 5, she wanted the community to accept Joel, especially now that Joel has gotten comfortable in the cozy town. Unfortunately, Bluebell has real life 'shippers and people weren't rooting for these two. Everyone knows that Dash's blog is gospel in Bluebell, and his poll showed that only 13% of citizens thought that Zoe and Joel were meant to be. On the upside, a lot more people thought the Rammer Jammer should get soft serve! It's taken me a little bit of time to warm up to Joel. [Note to readers: this is a substitute reviewer tonight]. At first I thought he was a poor man's Seth Cohen. Anyone who's seen The O.C. knows it's pretty impossible to recreate the chemistry that Rachel Bilson had with Adam Brody's nerdy Seth Cohen. However, as Kate noted in last week's Hart of Dixie review, Joel is a good guy and he treats Zoe well. I'm even enjoying Joel's bromance with Wade. In fact, it almost makes me think more highly of Wade. He's still in love with with Zoe but put aside any pettiness and reached out to Joel. Then again he did lead Joel to the sharks by driving him to the campsite when he was drunk so...maybe not. Lucky for everyone, Joel is safe after drunkenly ziplining and getting stuck. Plus, he and Zoe are up in the polls! Did those little girls at the campsite remind anyone else of the mini Blair and Serena from Gossip Girl, who once yelled at Dan and Serena about getting back together? If I remember correctly, and when it comes to GG I usually do, they too were involved in a romantic poll situation about Dan and Serena getting back together! It's hard when the public weighs in on your love life. While I get Zoe's point that this is the first time she's felt like part of a community and wants that approval, ultimately only she and Joel need to be sure they are right for each other. Not Dash's blog. I'm glad Zoe and George had time to talk and can find a way to be civil. George was harboring some serious hatred. I also liked seeing Lemon and Lavon team up for the Gazebos of Alabama project. Props to the production on finding a different prop to cover Jamie King's baby bump this week! Lemon was pretty zen in this episode, even taking the paparazzi shot of her and meatball's romantic kiss in stride. So let's turn the poll to you guys. Who do you think Zoe Hart belongs with?